If you watch the video, the media and residents are in complete denial that MS-13 could be in their community. But, just a week ago, 17-year-old Danny Centeno-Miranda was shot on his way to school. That’s 8 miles from this neighborhood. The three that shot him were all illegal immigrants and my money’s on them being MS-13 gang members. The people on Loudoun County feel terrorized and I don’t blame them. 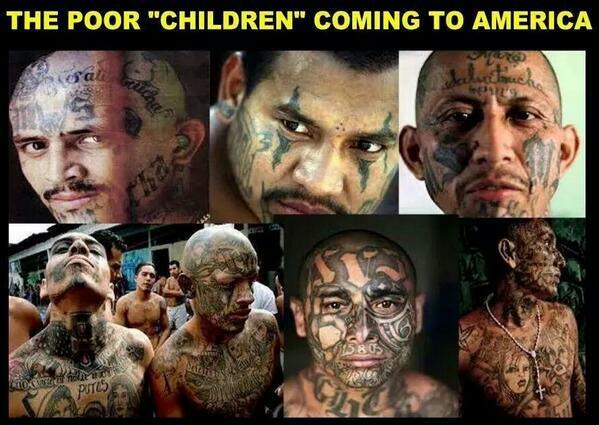 MS-13 is one of the most vicious gangs in the world and they are now in their neighborhood. They originally come from El Salvador… one of those places that Obama was so keen on taking illegal immigrants from… especially children. This type of terror has been imported into the country and placed throughout the states to cause a demographic shift and to destroy our nation. So far, it’s working pretty well, I’d say. Multiple buildings and vehicles in Loudoun County, VA were vandalized with graffiti tags bearing the moniker of a notorious El Salvadorian street gang early Tuesday morning. According to WUSA9, several vehicles on Gatwick Square and Wintergrove Drive were discovered with “MS-13″ spray painted on the exteriors. Additionally, walls, pillars and two parked school buses at nearby Trailside Middle School were also found bearing the gang tags. MS-13 is known as one of the most violent gangs in the world, and has been connected to a string of murders on both the East and West coasts. They are so feared in El Salvador, prison officials have allowed a detention center filled with 2,500 known members to essentially run itself. Centeno-Miranda was shot twice on Sept. 4 in Sterling, VA by 20-year-old Henry Dominguez-Vasquez, 18-year-old Juan Aguirre-Zelaya and an unnamed 17-year-old. All four men were in the country illegally. Dominguez-Vasquez and Aguirre-Zelaya were charged with possession of a firearm by a person who is not a citizen of the United States and accessory after the fact, and the juvenile was charged with 2nd degree murder and use of a firearm in the commission of a felony. It is currently unknown whether the two cases are related. The Loudon County Sheriff’s Office did not immediately return The Daily Caller’s request for comment. The teen that was murdered was also from outside the US – probably illegal as well. I’d say there’s an excellent chance that the murder and the graffiti are related. I would also say that it is a preview of things to come and I would bet the police there are on high alert. The people there are asking why them? Well, they are not unique. This is happening across the nation thanks to Obama. This is one of the bennies of letting an invading force occupy your country. I used to think you could get away from it, but Obama has made sure you can’t. It will come down to these communities policing themselves and having the nerve to eliminate the threat of gangs from their surroundings. I hope they are armed and I would get my kids out of the public school system. Then I would pray for a real conservative to get elected and get ready for battle.